I've noticed lately that Finn has started showing off bigtime for his best girl, Lilah. He'll start walking really silly when she's around or he'll make funny faces, or smack himself in the head, Three Stooges style. Because, as we all know, that's how his father wooed me. Here, I was trying to pose Finn and Lilah for a nice shot. 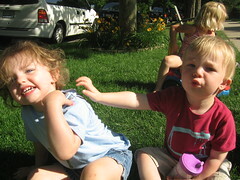 But everytime I was ready to shoot, Finn kept reaching out and doing "tickle, tickle" to Lilah. 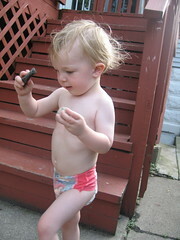 As soon as she grows pigtails, I anticipate Finn dipping them into the proverbial inkwells. 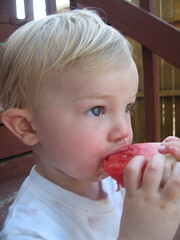 One of the things Finn loves the most about summer is that the big kids are also at daycare. 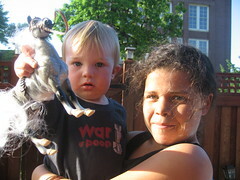 This is Finn with his friend, Olivia, who is eight years old. He really loves Olivia, constantly showing off for her and relishing all the attention he lavishes on her. The best part is how he pronounces her name, "Oh-wiv-ee-aahh." One of the things I love about our neighborhood is how family-oriented it is. You literally see kids everywhere, and if there's an even better way to meet people than having a dog, it's having a kid. 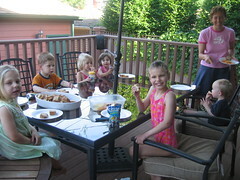 We all gathered at our neighbor's house for dinner before the neighborhood ice cream social Monday night. I hadn't been to an ice cream social before, at least not that I remember. The concept is so quaint! But they should have called it what it really is--a kegger for kids. Held in the middle school, they served up heaping bowls, cones, and floats, and then set the kids--hepped-up on sugar--loose in the gym. The reason I don't have photos of this event is because it was absolute madness. At one point the children found a bin of hockey sticks. (Say no more.) I spent the whole time chasing Finn around the gym, trying to keep him (newly emboldened on his sugar high) out of the line of fire. It was here that Finn also stated one of his first sentences, "I like ice cream." To further underscore the point, he picked up a hula hoop, and somewhat missing the concept, spun around holding the hoop around his waist. It was pretty much a blast. 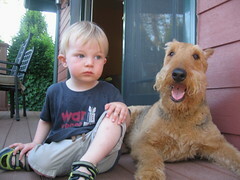 Here's Finn with our neighbor's dog, Ernie. He loooooves Ernie. He had a great time with her. 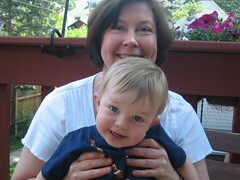 Nana had to leave while Finn was napping. After he got up, he started looking for her, saying "[Where'd"] Nana go?" It's been forever since I updated the site. I know you Finn Fans have been fruitlessly hitting "reload" and hoping for something to come up other than the Jimi Hendrix shirt photo. Turns out I lost my camera, and when I found it, lost the battery charger. Don't panic--everything has been found and the team here at Babymania is back in business. 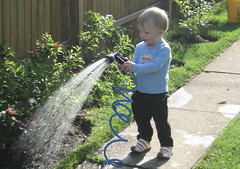 So please enjoy this shot of a (surprisingly much older looking) Finn doing some gardening. 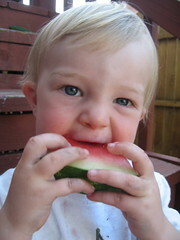 Doesn't he just look like a little boy in this photo, and not just a baby? See what missing a week of blogging can do?